The title of this exhibit comes from México en el mundo de las colecciónes de arte: México contemporáneo. 1, Volume 6, 1994, pg 132.
de percibir los artistas jóvenes (his Mexican work was clearly in its time a fresh water that inspired young artists)." Herbert Hofmann-Ysenbourg (1907-1973) began his artistic journey in Frankfurt, Germany after the First World War. His first training was in the Bauhaus workshops of Weimar Germany. The young Jewish sculptor transplanted to Paris in the late 20s where he furthered his training under the guidance of Aristide Maillol who had come to Paris forty years earlier from Roussillon on the Spanish border with France. From Paris, Hofmann-Ysenbourg was invited to the Museum of Modern Art in New York and was introduced to the works of the Mexican painter Jose Clemente Orozco. Orozco’s mix of the visual traditions of Mexico with the minimal, geometric abstract forms that Hofmann-Ysenbourg had seen in contemporary European sculpture of the period led him to travel to Mexico City in 1939. According to a career survey by Antonio Luna Arroyo, Hofmann-Ysenbourg fell in love with the artistic tradition of Mexico and adopted it as his new home. He also met and married a young art student, Kitzia Domenge, who also became a well-known artist, mostly for her stained glass work, and collaborated with Hoffmann-Ysenbourg - most notably on the Iglesia de San José del Altillo in Coyoacán, Mexico. Hoffmann-Ysenbourg’s own style eventually fell into a grouping similar to many of the ‘Generación de la Raptura’ who had rejected the dominant style of the Mexican muralists for a more minimal, primal, and modern aesthetic. 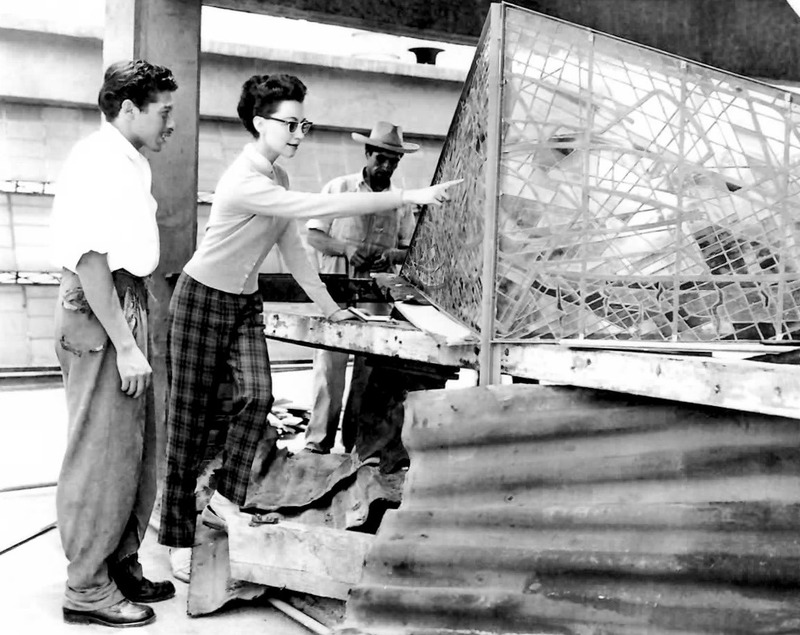 Generación de la Raptura would set the stylistic trend in Mexico through the 1950s into the 60s and Hoffmann-Ysenbourg’s work exemplified that trend. His most popular works combine new world and old world aesthetics. His sculpture can give the impression that one is viewing a piece unearthed from an undiscovered pre-Columbian civilization; at the same time, it is strikingly 1960s. His art was also an expression of an ascendent Mexico and the modernity with which this societal progress was inextricably linked. He admired Mexican colonial painting—and was a connoisseur of pre-Columbian archeology and mural painting—and remained inspired by traditional Latin American artists. The placement of Hofmann-Ysenbourg sculpture in public spaces around Mexico and South America such as the Nacional Financiera and the Corporate Offices of Supermercados SA in Mexico City are examples of his appeal to Mexicans in the early 1960s. Hofmann-Ysenbourg's combining of cultural influences to create his own 'immigrant aesthetic' worked well as a method of conveying the modernity of the corporate world while also demonstrating an embrace of Mexican culture. Around the same time, Hofmann-Ysenbourg’s sculpture caught the eye of a young executive, Dr. Al Stewart, who had come to Mexico City from the U.S. in the early 1960s. Dr. Stewart had been one of the first African-Americans to become an officer in the U.S. Navy during World War II. He then was able to earn a Ph.D. from the University of St. Louis, the first African-American to do so, only after prominent faculty at the University threatened resignation unless Stewart was admitted. Stewart was known to have spent time in Mexico in the early 1960s. Hofmann-Ysenbourg’s works would have also been visible to Stewart around Mexico City where a number of Hofmann-Ysenbourg’s works had just been installed. It is even possible that Stewart came into contact with Hofmann-Ysenbourg's work by way of his corporate commissions installed coincident with Stewart's time in Mexico. The art Stewart acquired in his life shows that he developed an enduring appreciation for Mexican art in particular. Regardless of his reasons, Stewart acquired a significant number of Hofmann-Ysenbourg's works and brought them back to his home in Connecticut. Hofmann-Ysenbourg stayed in Mexico for the rest of his life, eventually becoming a citizen. Kitzia Hofmann and Herbert Hofmann-Ysenbourg had a son, born in 1950 who is the renown cinematographer Henner Hofmann. Kitzia’s niece, Yvonne Domenge, who had received some training from her aunt, is a well-known sculptor. The grouping in this online exhibit of Hofmann-Ysenboug pieces was bequeathed to WestConn by Dr. Al Stewart. Stewart had served as a dean of WestConn‘s School of Business and had spent much of his career prior at Union Carbide. In addition to pieces by Hofmann-Ysenbourg, Stewart had also acquired pieces by Fernando Leal and Joesph Raskob (another European who emigrated to Mexico). It may be that Stewart saw in Hofmann-Ysenbourg‘s work a kindred spirit of another "outsider" who had forged a successful path to become an insider. Now, these pieces have found a home at WestConn for which Dr. Stewart had developed an enduring bond in his time living near and his time working at the University. The logo for this exhibit is Hofmann-Ysenbourg's mark - a scorpion. "Al Stewart: Still a champion of education after 50 years." News-Times. Accessed February 1, 2018. http://www.newstimes.com/news/article/Al-Stewart-Still-a-champion-of-education-after-233367.php. Canaday, John. "Housing Moderns In Mexico." New York Times (New York), April 18, 1965. Accessed February 1, 2018. Goldman, Shifra Meyerowitz. "Nueva presencia: the human image in contemporary Mexican art." Ph.D. diss., 1977. Nelken, Margarita. "Nuevos Aspectos de la Plastica Mexicana / New Aspects Of Mexican Plastic Arts." Artes De México, no. 33 (1961): 1-10. http://www.jstor.org.wcsu.idm.oclc.org/stable/24312126. Olson, Emily. "Transcending "Insider" Art: Enrique Chavarría, Surrealism, and Outsider Art." Ph.D. diss., Thesis / Dissertation ETD, 2011.